When Transforming Transportation (TT) started 16 years ago, the transport landscape looked very different. Ride-hailing services were unheard of. Shared bike systems were exclusive to just a few cities. Smartphones were still years away. No one had heard of Facebook or Twitter. Today, transportation is changing at a breakneck pace, driven by disruptive new technologies and companies, and the sector is recognized as central to global development and climate goals. 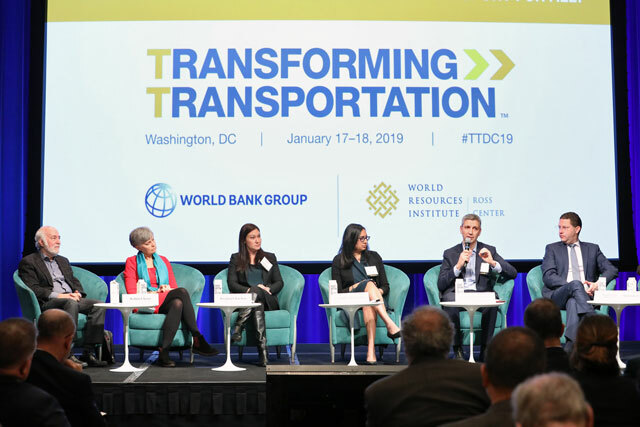 “When we talk about new mobility, we are actually talking about the most critical goal of the World Bank, and that is eradicating poverty,” said Kristalina Georgieva, CEO of the World Bank, on the first day of TT 2019 in Washington, D.C.
Dockless bicycles, electric scooters, networked ride-hailing companies and autonomous vehicles could help cities swap road space for green space, affordable housing, and other uses; reduce the 1.35 million-plus road deaths every year; expand economic opportunity; reduce toxic air pollution; and help limit global warming. However, those results are not guaranteed, said ministers, mayors and transport experts throughout the first day of the conference co-hosted by the World Bank and World Resources Institute. Too Fast or Not Fast Enough? “In most places, transportation, as we know it, isn’t working very well,” said Dan Sperling, founding director of the Institute of Transportation Studies and professor at the University of California Davis. New mobility services promise a new way: shared rides that drastically reduce the need for parking and individual cars; “last-mile” connectivity to more efficient mass transit systems; and safe, easy-to-access “micro-mobility” options. But much of this potential is unrealized to date and – if speakers at TT are a good sample – there’s much disagreement about how exactly to begin unlocking that, whether in developing or developed countries. Sperling urged policymakers to focus on incremental change, rather than “moonshots” and the futuristic scenario of driverless cars taking over city streets, which are not imminent. “It’s good to have vision but we need to know what we can do now that makes sense.” Traditional mobility challenges, like improving the capacity of mass transit and expanding access to all residents, should still be the focus of governments and communities, he said. Others, however, urged a more rapid embrace of new mobility services and technologies. For the sake of sustainability, we need to move at “10 times the current pace,” said Robin Chase, co-founder of Zipcar who this week launched NUMO, a global alliance “to create joyful cities where sustainable and just mobility is the new normal.” To reach the 1.5 degree climate target, transport emissions must be reduced 40 percent by 2050, while expanding service. Transport is also key to achieving multiple Sustainable Development Goals, like reducing poverty and improving health. “We can’t think about transport as a singular sector, but how it’s integrated in almost every solution,” said Georgieva. New mobility services are here, but the uncertainty surrounding their impact was highlighted by city leaders from Latin American and Africa, who outlined difficulties in translating their promise into reality. But Espinel also said that when Quito began looking into acquiring electric buses, there was significant uncertainty over battery technologies and how they would interact with the city’s high altitude. They couldn’t get a clear answer. Solomon Kidane Zegeye, deputy mayor of Addis Ababa, said that although the “leapfrogging” potential of new mobility is often touted, most new mobility solutions are still designed for developed countries first. This makes it difficult to adapt them to contexts with less existing infrastructure or technical expertise. For example, he noted the electricity supply for Addis is limited and not very reliable, and there are fewer skilled electricians to service electric vehicles. For Zegeye, success is simply increasing the number of trips per resident in the city beyond the current 1.2 a day, creating a more mobile society.